We bought a echo hitch 2 inch receiver. They accidentally sent the 1.25 inch. They have been great and will ship a 2 inch one tomorrow but am having second thoughts on which size is better. 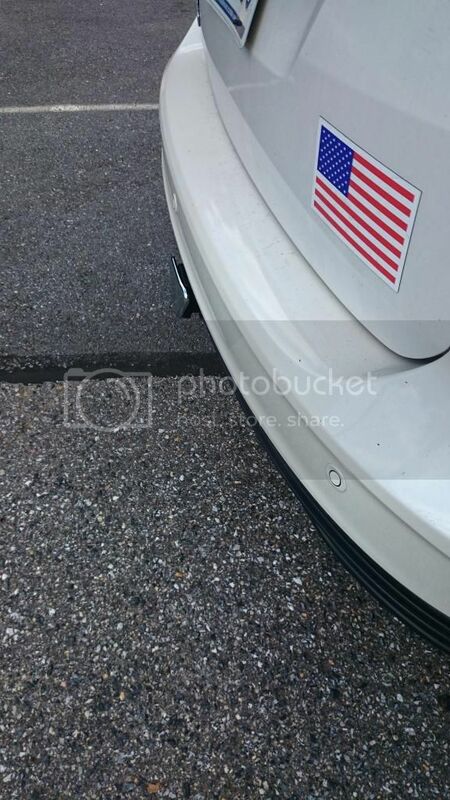 Anyone have the 2 inch ecohitch? Any concerns with ground clearance between the 2? We currently have a Yakima rack but are considering the single 1UP USA rack to carry one bike (and we will get the add on for a second bike). My bike fits inside with both wheels on, so most of the time, only one will be outside. Anyone with this configuration? Ecohitch plus 1UP? There are some old threads but nothing recent. BTW - kick open does still work but a bit tricky to find the sweet spot. 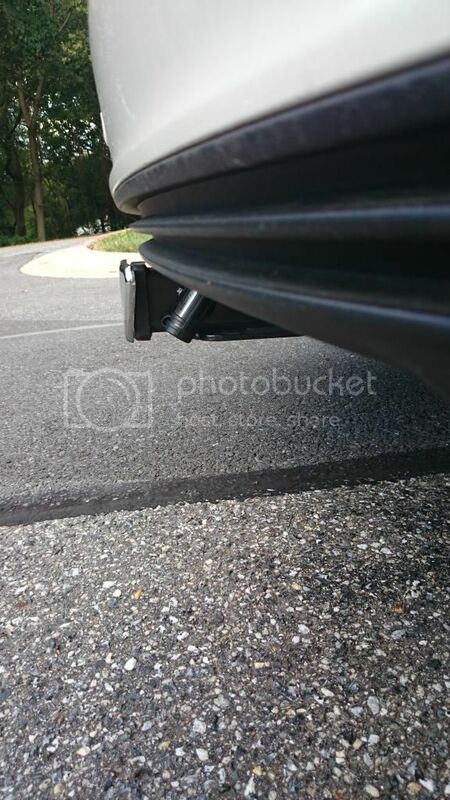 We are concerned about ground clearance with the C-Max and a 2 inch hitch receiver. We are also somewhat concerned about a 3 inch blob sticking out the back end of the C-Max but want function over fashion. Anyone have any issues with ground clearance with a 2 inch hitch receiver? I have a 2" Ecohitch. 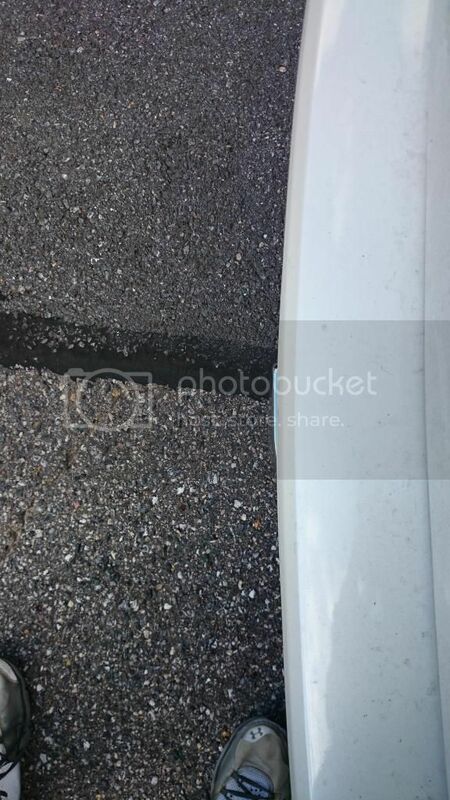 I've never had any ground clearance issues. 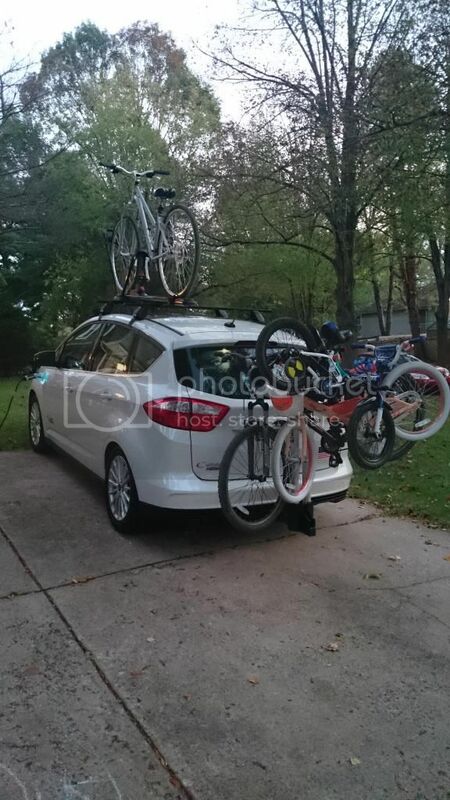 I have to back out of my driveway, that's sloped, and it also has about a 3 inch drop off from the driveway to the street, and I've never had an issue with scrapping, even with my C-Max fully loaded (see below photo for example of being fully loaded. Not sure if you can see in the below photo, but the Ecohitch doesn't stick out the rear end at all. It's flush with the bumper, if not slightly tucked under. Wow bro1999. - that is impressive! 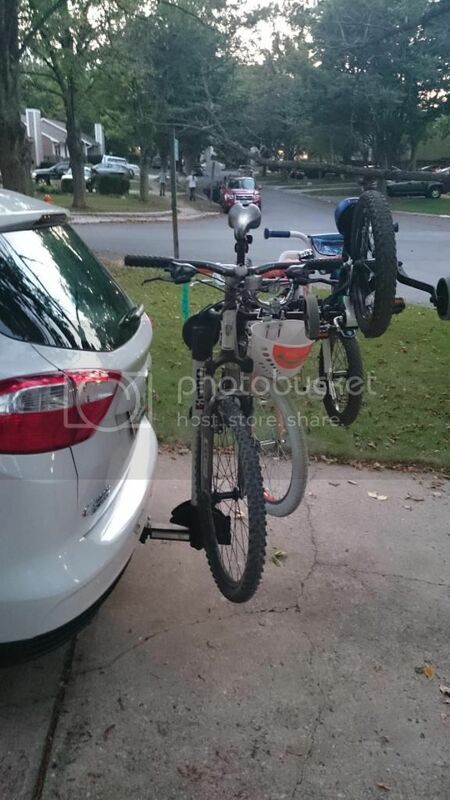 Do you have a picture of the hitch without the Thule box? I measured the ground clearance, and it's 8.5 inches from the lowest part of the hitch to the ground. Some photos of just the hitch are below. I should add I have an Energi, so the couple hundred extra pounds of battery might actually make my C-Max sit a little lower than your hybrid. This is purely conjecture, though. Edited by bro1999, 19 September 2014 - 10:10 AM. No problem with the 2", which I'm glad I got as it fit my existing bike rack and the tray I bought at Harbor Freight without the need for an extending sleeve. Doesn't really extend beyond the bumper. What kind of hit to your MPG do you think the Eco hitch made to your Energi? I'm looking for a bike rack and thinking "trunk" or hitch mounted. No idea. The bikes are nearly completely behind the vehicle so it would depend on the turbulence it creates. Thanks, I'm torn between getting the Eco Hitch & rack or just a "trunk" mount bike rack. Edited by Kunari, 26 September 2014 - 06:59 PM. I have not noticed any mpg changes and have several 50-75+ mpg trips. Averaging the same mpg for the tank of gas since instal. Hubby is supposed to order but no activity so I will probably have to order. My husband ordered the 1UP USA rack for me for Christmas. it arrived - now, can I wait until Christmas to test it? i got the 2" echo hitch with kuat nv. no clearance issue, although i am worry when things get steep. picked the 2 bike addon as well. may try putting all 4 on it and see how things goes. Timber- we debated between the Kuat and the 1up. Can't wait to see a picture of your set-up. I will try ours out after Christmas, although we won't get to ride for a couple months in A2. I hope we made the right choice to stay the course with the 1.25 inch hitch. I posted on 2014 forum as well. Kick open works when no bike on the car. The single rack folds up so compactly that I can open the hatch and have great visibility with the rack. I have been using the single mount. Today, I tested the double. It took me less than a minute to mount the second rack piece. The bike is stable and I have used it with my Colnago and Seven. Today, I tossed my Colnago inside Phantom and put my husband's Seven on the rack. I averaged 57 MPG for the 20 mile trip home on the highway with the bike on the back. I forgot to look at the mileage on the way out but guessing around 43 MPG - both good with a bike in tow! I am not one to tout a product but 1UpUSA but this one is worth it! Just bought a 2015 C-Max hybrid and thinking of adding hitch and Thule box like you have. Wondering if any problem with the Ecohitch as it's advertised have only 200 lb weight limit vs a Curt with 350 lb limit. Only disadvantage I see is having to drill 2 holes. How much weight have you carried in the box? Is it a 1.25" or 2.0" coupler? Also the Curt recommends using their stabalizing strap for any "non-trailer" load like a bike rack or Thule box. Have you used one or just have the box mounted in the hitch? Thanks for any info!! I was looking at the Ecohitch until I checked with the local "authorized" installer here in LA. They (Rack N Road) said they wanted $156 to install it. They don't seem to stock them either though on their website it seemed like they might. How long did it take you to install the hitch for those of you who did it? The problem I have is there is no place I can really work on the car to do it myself. i am prohibited from working on it where I am normally at. If not too long of an install, I might just try and wing it and do it in a remote parking lot myself. My echo hitch was easy. No drilling required. Just had to remove 2 bolts on the muffler and install the longer bolts that came with the hitch plus 2 other bolts that had holes already in the frame from the factory. There is a metal tab that had to be bent over so the the hitch would fit. pliers and hammer no big deal. Took me about 30 mins to put it on by myself.